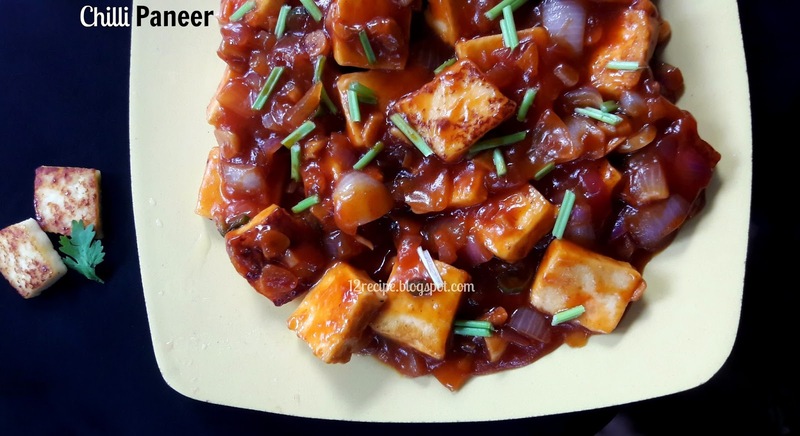 A delightful sweet and spicy paneer preparation in Indo-Chinese style. In a non-stick pan add a tablespoon of oil and saute the paneer cubes on both sides for few minutes until just golden in color. Heat a pan with 2 tbsp of oil. Add ginger garlic chopped and green chilly; saute until golden. Add cubed onion pieces and saute for a minute. Add chilly powder and mix well. Add all the sauces and mix well. Add corn flour by diluting with 1/4 cup of water. Cook for about two minutes until gravy thickens. At this time add salt and paneer cubes. Mix well for a minute and switch off the flame by garnishing spring onions on top.